I love moist, tender and fluffy cakes that are not overly sweet. Among the different types of cakes I’ve made, chiffon cakes perfectly fulfill my requirements! 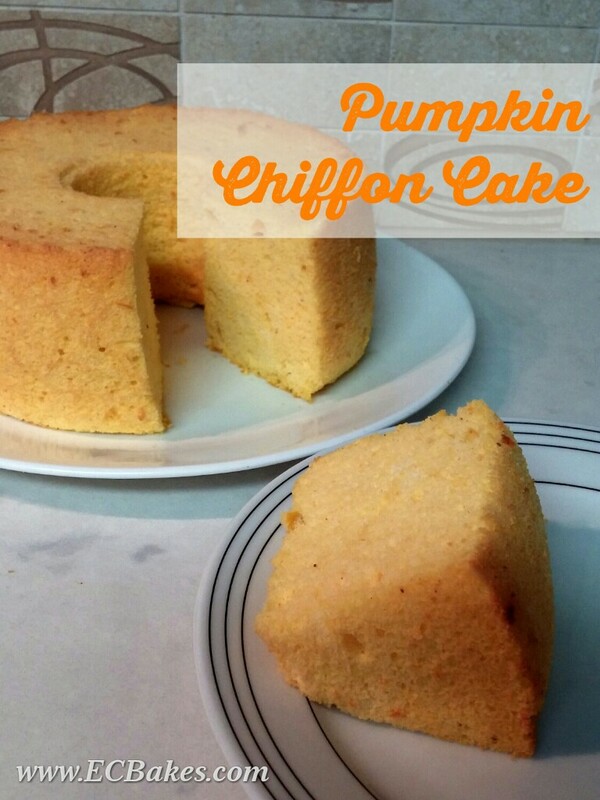 This pumpkin chiffon cake is based on my basic chiffon cake recipe. I used mami squash to make my puree this time (read about my homemade pumpkin puree post here). I found that mami squash is less watery than pumpkin and has a creamier texture. It actually tasted like roasted yams, but only sweeter. Another good thing about mami squash is that it can be easily mashed into puree with a fork. EC喜歡吃鬆軟濕潤但不太甜的蛋糕, 在自己做過的蛋糕中, 只有雪芳蛋糕符合以上條件. 這個南瓜雪芳是在原味雪芳食譜加入南瓜泥(南瓜泥做法請到這裏). EC今次買了比南瓜甜及較少水份的媽咪瓜. 烤好的媽咪瓜口感較幼滑, 味道像煨蕃薯, 但比蕃薯更甜! 只用叉子壓已能輕易壓成泥, 不像南瓜般壓來壓去還是一絲絲的. Preheat oven to 325ºF/160ºC. 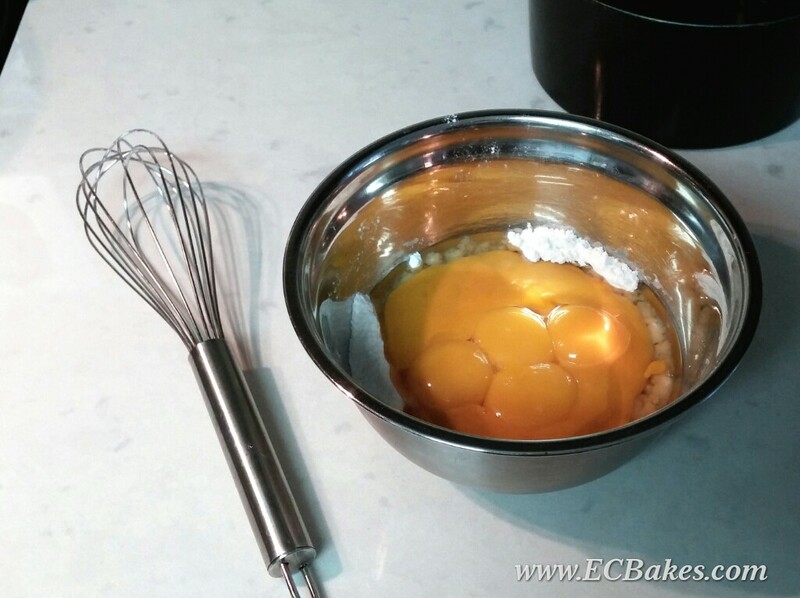 Separate egg whites and egg yolks. Mash roasted or cooked pumpkin with a fork. 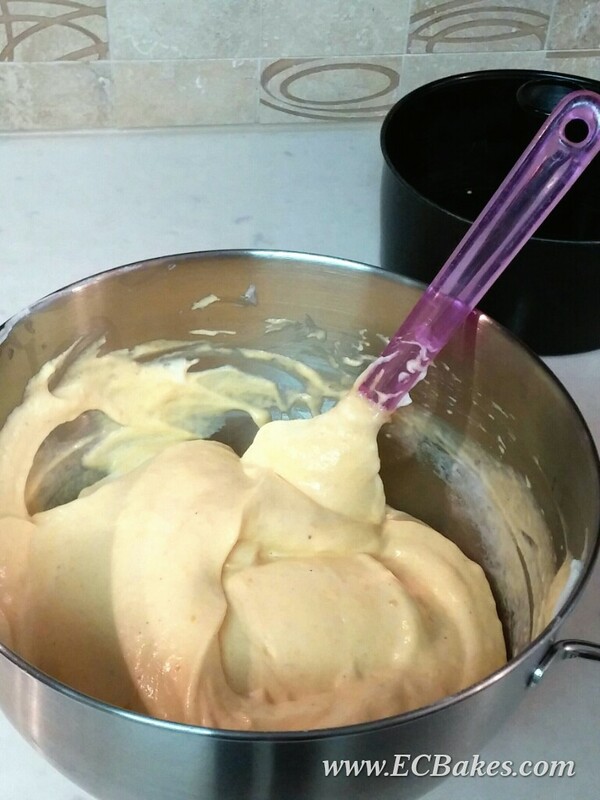 To make the yolk batter: sift together the cake flour, cinnamon and sugar into a mixing bowl. Mix well and make a well in the centre. Add oil, milk, egg yolks, and pumpkin puree in the well and whisk gently until combined. To make the meringue, wipe the mixer bowl and wire beater with paper towel and vinegar or lemon juice to remove traces of grease. 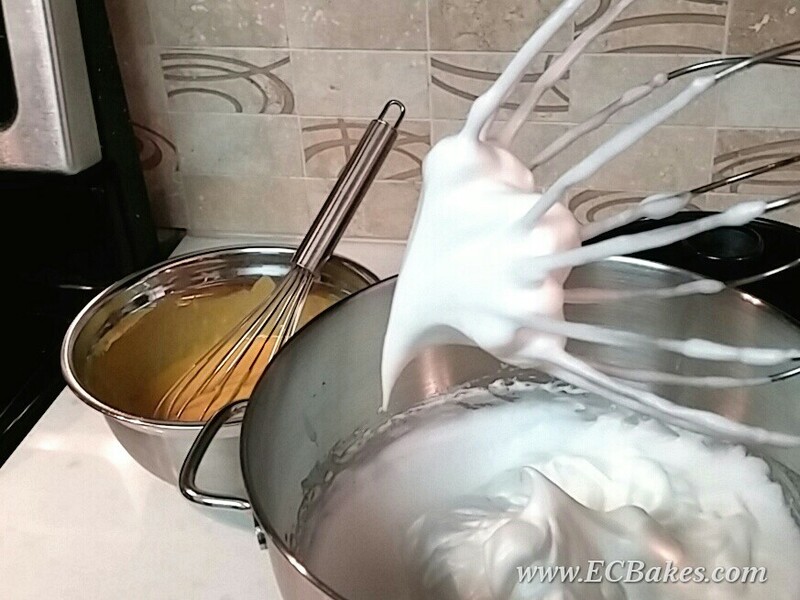 Whip egg whites until foamy. Add cream of tartar (to stabilize the meringue) and continue to beat egg white until soft peaks forms. Then slowly add sugar in batches and continue beating until glossy and firm peaks form. When you lift the whisk, the peak will hold it’s shape but the tip will fall back slightly. 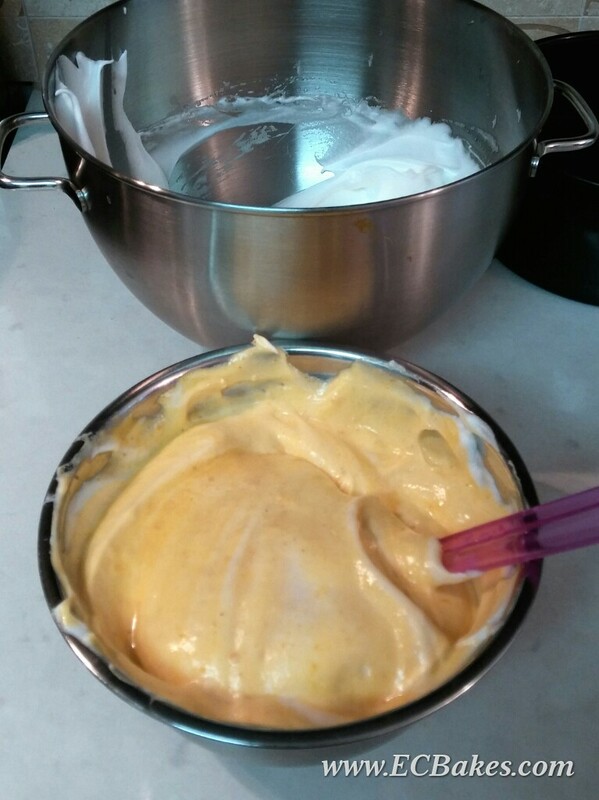 Scoop about one third of the meringue into the yolk batter and mix well to lighten. Then pour this back to the remaining meringue. Fold gently and thoroughly until you see no streaks of white. It will be done in about 15 to 20 strokes. Do not overmix or you will risk deflating your meringue. Pour batter into an unprepared 7-inch chiffon pan and smooth the top with a spatula. Tap pan against the kitchen counter several times to get rid of any large air bubbles. 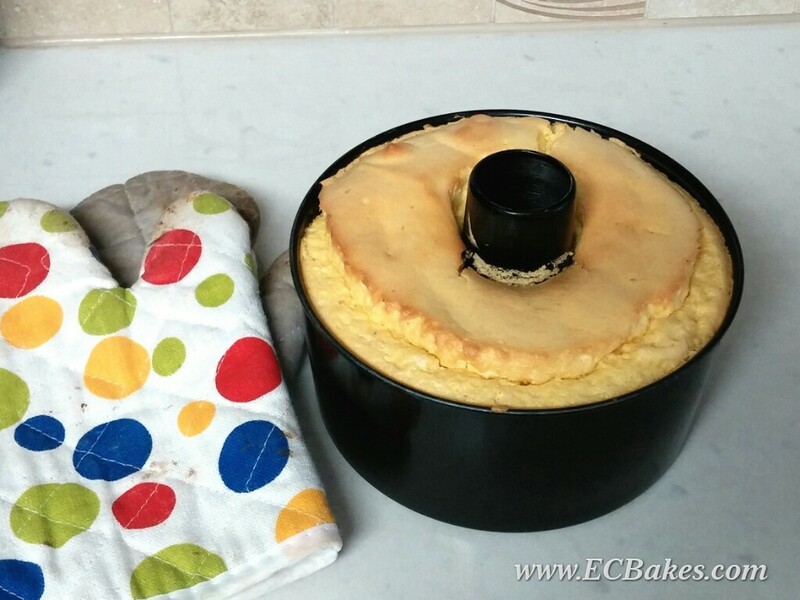 Bake for 30 to 35 minutes until cake is done (adjust baking time and temperature according to your own oven). To prevent sunken cake, drop the pan on the kitchen counter at a distance upon removal from the oven. This will release any gas trapped in the cake cells and make shrinkage more uniform. 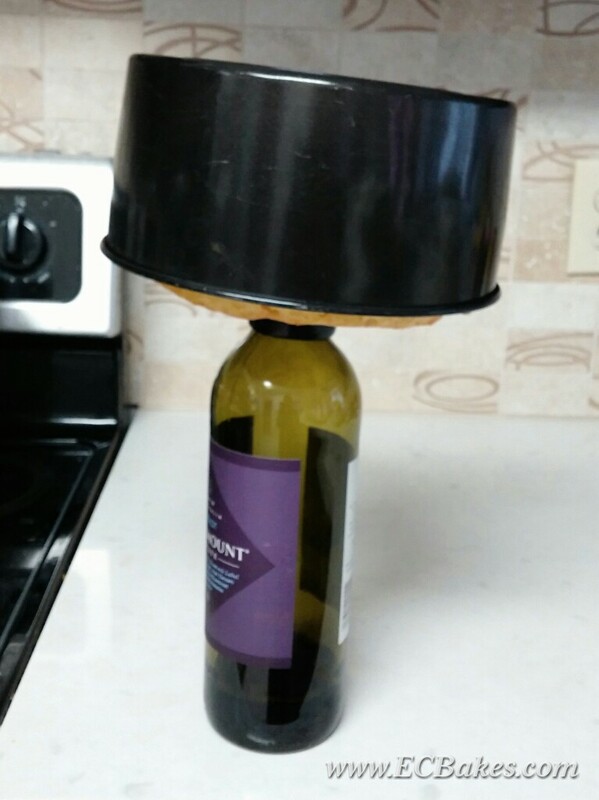 Invert the cake pan and cool on a cooling rack or a bottle. 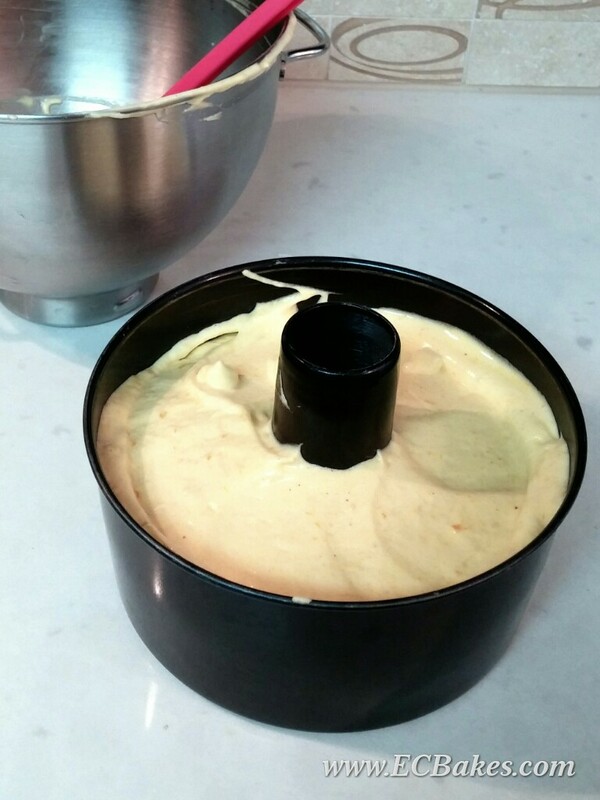 Once cooled, remove the chiffon cake by running a palette knife against the sides and bottom of the cake pan. I usually do this by hand to get a smooth finish. Recipe is based on my own vanilla chiffon cake recipe, which is adapted from 君之. 版權所有, 如需引用, 請註明出處 If you want to republish this recipe, please link back to this post.